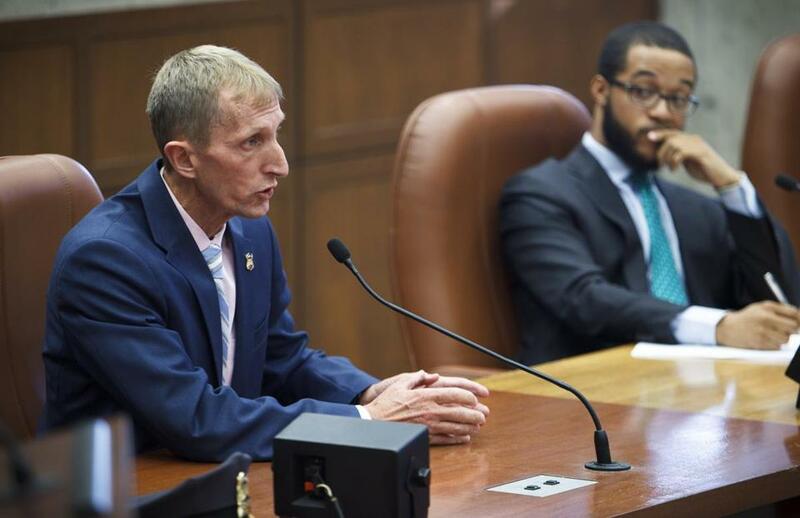 Boston Police Commissioner William Evans spoke during a City Council hearing on the issue of police body cameras. As the Boston City Council considers an ordinance to outfit the city’s police force with body-worn cameras, the public’s right to know how law enforcement conducts its business with citizens should be at the forefront of the debate. That’s why comments by Police Commissioner William Evans in the Boston Herald calling for legislation to regulate citizens video-recording officers is a step in the wrong direction. Instead, the city should move forward with a pilot program that would give a small cadre of Boston Police officers body-worn cameras. Body cameras might not be a cure-all for police accountability, and some worry that they can actually undermine the community’s trust for that reason. There are also privacy concerns for certain uses, such as domestic violence cases. But the benefits of creating a video record of police interactions likely will far outweigh the negative consequences, especially if cameras become a staple of police gear. Evans has expressed caution about rushing to use the cameras, but starting a significant pilot program and evaluating its effect is a sensible move. Last week, the Boston City Council held a hearing on a proposal to outfit police officers in the city with body-worn cameras — a measure that, if approved, would cost the city about $3 million annually. That’s why Evans’s prudent approach makes sense. “It’s a reality, they’re coming,” said Evans in an interview about body cameras. “I don’t want a program that’s going to be mandated to us.” Evans added that negotiating with the police unions would take some time too. “Anytime we change the working conditions of our officers, we have to bargain with” the unions. But attempts by the Boston Police — or any force – to prevent members of the public from videotaping interactions between officers and citizens risk thwarting basic constitutional rights and will most likely be challenged in court. Sunday marked the first anniversary of the shooting death of Michael Brown in Ferguson by a police officer, and protests that triggered an unprecedented scrutiny of the state of policing in communities of color across the nation. Studies have shown that body-worn cameras reduce use of force by police officers, as well as civilian complaints against them. (According to testimony offered during the city council hearing, Boston paid $14 million last year settling lawsuits claiming police misconduct.) Last year, the US Department of Justice issued a study detailing policies and recommendations for law enforcement agencies to implement a body-worn camera program. What’s more, earlier this year the DOJ announced plans to distribute an initial $20 million in 50 competitive grants to fund body-worn camera pilot programs. If body cameras save a life or record exceptional police work in action, the cost will be well worth it. The ubiquity of recording technology can’t be stopped. It’s time for Boston to use that technology to its advantage.